Small and medium-sized businesses (SMBs) in most world economies suffer from a series of intense economic pressures from local, regional and international markets. Although these problems are microeconomic to the small and medium-sized business, they are directly related to macro economic factors, particularly in the case of labor. One of the main pressures small and medium-sized businesses suffer from is the lack of worker technical skills. Past research has consistently shown that virtual reality (VR) can be effective for supporting competency-based training skills. The objective of this chapter is to provide an overview on how virtual reality can be used to support technical training in SMBs, including the use of Second Life and DIVE VR platforms. This chapter describes a desktop VR Application for training car mechanics from a small business and highlights advantages and challenges of desktop virtual reality for technical training. Finally, future trends related to the use of VR in training are discussed. Small and medium-sized businesses, or SMBs, comprise more than 90% of the firms operating in most world economies. These businesses play a critical role in the economic activity of their respective countries in almost all productive sectors and contribute to the majority of employment and the gross domestic product (GDP). As the U.S. Census Bureau points out (U.S. Census, 2007), small and medium-sized businesses have fewer than 100 and 500 employees, respectively. Similarly, the European Union establishes that small businesses have fewer than 50 employees, and medium businesses have no more than 250 employees (European Commission, 2003). However, SMBs worldwide suffer intense economic pressures from local markets as well as competition among regional and global competitors. In addition, a number of problems associated with a lack of skills affect the productivity and ultimate survival of SMBs. According to Hamburg and Engert (2007), SMB employees often lack necessary skills to remain competitive in national and international markets. Moreover, SMBs need to develop core competencies to succeed, such as technical topics, including information technology (IT) competencies (Mascarenhas et al. 1998; Tapias Garcia, 2005). Small businesses need to define skills and core competencies, since they are a basis for marketing, and for making operational decisions. If a business plans to grow, it needs to develop existing core competencies and expand them. If a SMB does something very well and remains focused on it by means of adequate training, it will have a competitive advantage and tend to become a leader in the specific business field (Srivastava, 2005). There is no question that the development of core competencies can be achieved with the support of technology. Past research shows that computer and Internet-based specialized instruction (e-learning) is an effective way to deliver training courses. Recently, technologies like virtual reality and 3D graphical models displayed on Web pages have been effectively researched and employed for technical training (Gerbaud & Arnaldi, 2008). Virtual reality, or VR (Burdea & Coiffet, 2004; Sherman & Craig, 2003), today, is one of the new frontiers in training and education, both of which extend to the workplace. Some of the advantages of using virtual reality in training and education include first-person experience, active trainee participation in the learning process, multimodal learning (the use of multiple human senses to perceive information), ease of communication between trainees and instructors by decreasing anxiety, lowering of social barriers in a collaborative virtual environment (Youngblut, 1998), as well as enhancing trainee perception and analysis of 3D graphical models and other types of technical information (Dede et al., 1996; Roussos et al., 1997), among others (Cao et al. 2008). The objective of this chapter is to provide an overview of desktop virtual reality and how it can be used to support technical training in SMBs. 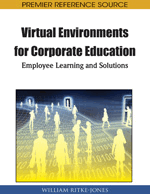 This chapter also highlights advantages and challenges of virtual reality for training. In addition, two important, economical and widely used programs for developing and displaying desktop virtual environments are also analyzed for their potential use in training. Section Background describes an overview of technology applied for training personnel in SMBs. Section Virtual Reality Technology outlines a general description of research and applications carried out with virtual reality (and what it is not) and its classifications. Section Second Life refers to a description of this virtual environment and current Second Life applications for education and training. Section DIVE and Other VR Platforms covers a general description of Distributed Interactive Virtual Environment (DIVE), an open source program for developing collaborative virtual environments.